Velasquez’s Las Hilandras, The Spinners, 1657. Only in 1948, Diego Angula claimed this painting represented Ovid’s Fable of Arachne. Helmeted Athena stands in the background while in the foreground, the contest itself between Athena, disguised as an old woman, and Arachne. Marina Warner suggests that: one of women’s main tasks- textile making from wool to the finished cloth, is like the structure of fairy stories with its repetitions and elaborations, so that story telling is an act of spinning a yarn and weaving a tale. Spinning and weaving is a continual thread we’ve noticed running through the Odyssey and the myths we’ve been reading. Edmunds observes that the Homeric poems ‘ portray weaving as heroic, magnificent, clever, valuable, the womanly counterpart to warfare.’ Penelope weaves by day and unweaves at night to keep the suitors at bay; Helen weaves of the Trojan war, Andromache ‘weaves flowery love charms, not knowing that Hector is dead’, Arete, as well as the goddesses Circe and Calypso, weave. In other myths we read of Ariadne’s ball of twine that allows Thesues to escape from the labyrinth; Athena weaves and beats the boastful Arachne with a shuttle then condemns her to weave for ever in her metamorphosed spidery state; the fates spin out the lives of men; Jason searches for the golden fleece and all the while a yarn is spun, a text is created, a rich lexical tapestry spread before the listeners and readers. This week we’re tangled in a web of words! These words and their ancient roots send threads out to other words, and in our telling of their stories we have woven them into the fabric of our year. We’ve all chosen a word to pursue – to uncover the weft and warp. 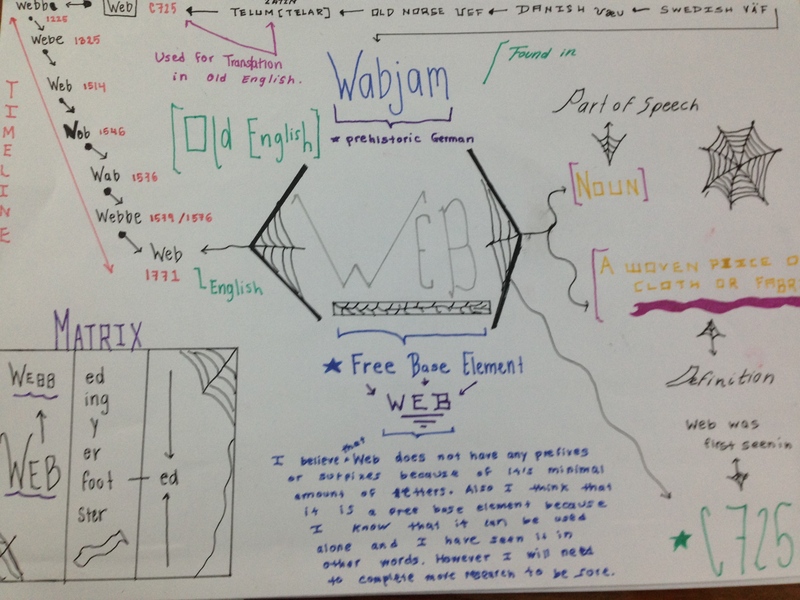 Weave a free base element, a simple word meaning there are no other elements – no suffixes, no prefixes. A word comprised of 5 letters, 3 phones, 3 phonemes /wiːv/. The digraph <ea> represents the lengthened vowel phone/i:/. Phonological Investigations: What position does the digraph <ea> occupy in the base element to represent the phoneme /i:/? Initial, medial or final? 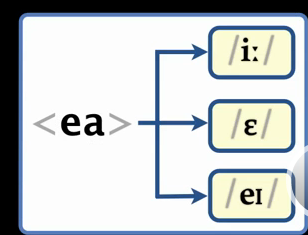 The digraph <ea> represents two other phonemes (see diagram). Collect words with <ea> in the base representing each phoneme below. Note the digraph position. What statements can you make based on the evidence? What qestions are raised? (Real Spelling Toolkit 3D- is essential reading here). The earliest attestation of weave is from the Old English period, around 900 (OED) as wefan, past tense wæf, plural wǽfon, where it carried the meaning of ‘to thread with interlacing yarn’. It had a figurative connotation of devising, contriving, arranging (Online Etymology Dictionary). In the 14th and 15th centuries, the past participle wæf <wave> assimilated to the past participles of strong verbs whose bases had a final liquid (e.g. steal, stolen) with ‘ the o of the past participle extended to the past tense both singular and plural'(OED): <wave> became <wove>. However, the yarn does not stop here! Old English weofon derives from Proto Germanic *weban and stretches even further back to a Proto Indo European root: *webh- to weave, to move quickly.The same P.I.E. root occurs in web, weft, woof. It’s at this level that the threads of the tapestry are exposed. Pull one thread and we find more words that make up the tapestry of this family. Who would have thought that the stories of weave, wasp and weevil to be woven together? Emil Zeck, artist of the brown vegetable weevil above, was selected in 1908 by the Government Printing Office as a Cadet Art Draftsman, and became their chief entomological (not etymological) illustrator. Weevil:has threaded or scuttled its way from P.I.E. roots *webh-, via Proto Germanic *webilaz to emerge in the O.E. period as wifel and then evolve to the present day spelling of <weevil>. Note the similarity in the place of articulation between voiceless /f/ and voiced /v/ in the old and pesent day form of this word. Place your fingers on your larynx as we did to test this; the larynx will vibrate on the voiced /v/. Both consonant phones are ‘labio-dental fricatives ‘- the lip and teeth are involved in the articulation. Skeat suggests the weevil – weave link is ‘from the filaments spun for the larva-case’ . However, in the 16th and 17th centuries some writers apparently confused the name of the weevil with that of the weasel, using wesell , weezel (OED). I can only imagine the consternation it may have caused when complaining of weezels or weasels in the flour! Initially <weevil> referred to any beetle, but narrowed by the 15th century to refer to those in the ‘superfamily Curculionidae’. Wasp: Proto Indo European *webh- may have led to another PIE root *wopsa– or *wospa which evolved to Proto-Germanic *wabis-. Influenced by Latin vespa, the Old English word wæps, wæsp enters English. Latin vespa continues with its waspish droning in the form of a sleek and retro motor scooter, Vespa, where riders imagine themselves not wasps but an Audrey Hepburn or even a Gregory Peck. 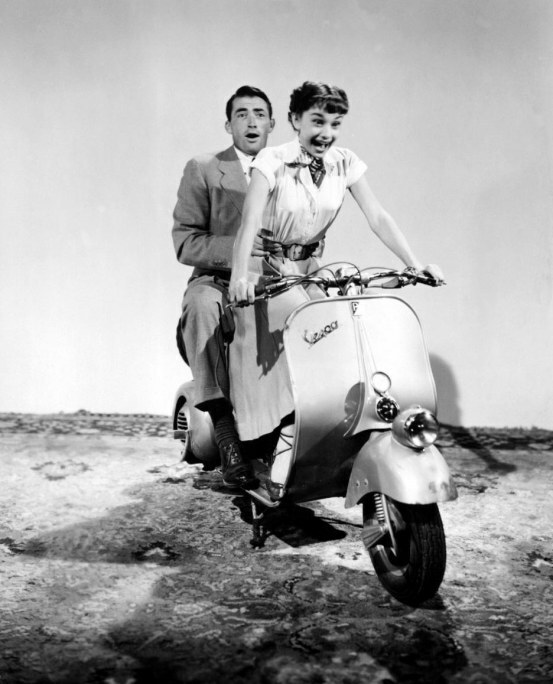 Audrey Hepburn’s stylish dash through Rome on a vespa in her 1953 movie debut Roman Holiday, led to a sharp rise in sales- 100,000 just after the release of the film. Audrey Hepburn, Gregory Peck on vespa from Wyler’s 1953 Roman Holiday. Cobweb: Spiders were once called attorcop (1000)- poison-heads. Old English attorcoppa, a compound, is formed from átor, attor, poison and the word coppa, a derivative of cop: top, summit, round head, or even copp: cup, vessel. This was ‘in reference to the supposed venomous properties of spiders’. The Dutch word spinne-cop meant ‘spider,’ and the cobweb was cop-webbe. The OED suggests cop was itself ‘spider’ and later misapplied to a cobweb or spider’s web in 1530. Spider: As Lea, a Swedish speaker, discovered a spider is a spinner. This was obvious to her as the word in Swedish is still spindel. She recognized <-er> as an English agent suffix ( someone or something that does something) but concluded in Present Day English <spider> is a free base element as we found no evidence of <-er> being substituted by another suffix. She found that Old English spíþra derived from *spinþra, from spinnan: to spin and was surprised that despite Old English spiðra, it was less common then than loppe. We loved the discovery of another spider synonym, Old English gangewifre: “a weaver as he goes”. Old English lop,was attested in 888 and in 1000 lob was attested with spider (1340) gradually taking over. Both lop and lob faded from use until briefly resuscitated by Tolkein in The Hobbit and Lord of the Rings. (OED). Russian illustrator, M. Belomlinskij shows Bilbo confronting spiders. Go to the wonderful artblog Fishink to read more about Mikhail Belomlinskij. Old fat spider spinning in a tree! Old fat spider can’t see me! are weaving webs to wind me. but still they cannot find me! you are fat and lazy. Read the journey of spinster <spin+ster> from one who spins to the pejorative designation of an unmarried female. When we tell stories we can be accused of concocting a tissue of lies, of fabricating, pulling the wool over one’s eyes, fleecing others, of spinning a yarn, stringing someone along. And this is where we began with Penelope’s fabrication- the waxing and waning of her weaving. Byatt regards this act as a ‘ tragic way of keeping the thread of time unwound, of keeping her marriage unchanged through the long years of the Odyssey’.The Online Etymology Dictionary also suggests how thread and weaving are woven into Penelope’s name:Greek πηνη: ‘pene ‘thread on the bobbin’, from penos ‘web’, cognate with Latin pannus:’cloth, garment’. ‘We think of our lives – and of stories – as spun threads, extended and knitted or interwoven with others into the fabric of communities, or history, or texts’ ( A.S. Byatt). All students found something interesting in this word inquiry, gradually becoming more comfortable in dictionary delving. They understand that words evolve over time, travel, as do they as international students, and through the travelling are influenced by the places and languages encountered. These investigations were messy. Students would come in to the class before school, after school, during lunchtime to share their discoveries. They were new to the dictionary and the enormity of the OED, many were new to the concept of etymology let alone the resources to discover this. Some became bogged down in cognates, some, including me, went off on small side-paths. However, every investigation was an opportunity to refine our understanding of morphology, etymology and phonology, for these go hand in hand and are threaded into the fabric of each word. Our tapestry of weaving words is far from complete- we have more tales to spin in our next post, more yarns to tell. Follow our threads! Skot Caldwell's: Who In the World Am I? Why is There a 'b' in Doubt?